Access to our scheduled training, self-help support materials, and technical support is included in your subscription. Custom technical work, document customizations, workflow consultations and customized training sessions are available at a rate of $150 per hour. A discount of 10% is available for purchases of bundles of five hours. The Tailwind Maintenance & Support Policy for Enterprise customers ensures current and future customers are provided world class products and services on a consistent and continuing basis. The cost of Annual Maintenance and Technical Support for the first year is included in your initial product investment. Annual Maintenance guarantees the receipt of regular updates to Tailwind, which ensures the ongoing integrity of the software. Technical Support offers maintenance customers access to Tailwind’s experienced technical support team. This team provides a comprehensive set of essential services such as ongoing training, report customization, user optimization, third-party data integrations, and emergency recovery – services designed to ensure optimal performance of your business operations.The Tailwind Maintenance & Support Policy for Enterprise customers ensures current and future customers are provided world class products and services on a consistent and continuing basis. Technical Support offers maintenance customers access to Tailwind’s experienced technical support team. This team provides a comprehensive set of essential services such as ongoing training, report customization, user optimization, third-party data integrations, and emergency recovery – services designed to ensure optimal performance of your business operations. Tailwind software is designed to work effectively with multiple third-party operating systems, databases, and software products. These products and systems are constantly evolving with new versions launched every year, and in some cases more frequently. Our maintenance program allows our development team to invest the time and resources required to maintain compatibility with constantly changing technical requirements and environments. For this reason, Maintenance is a requirement as it ensures the ongoing reliability of Tailwind products while continuing to meet users’ needs. Maintenance is charged at a flat amount per user per annum for customers who have purchased the Enterprise version of the product. Platinum Technical Support is included in your initial product investment during the first year, and is an optional service in year-two and beyond. Based on your needs, there are two levels of support – Gold or Platinum. Silver includes enrollment in the Annual Maintenance program and provides access to technical support on a pay-as-you-go basis. *Additional custom report creations are available at indicated hourly rate. 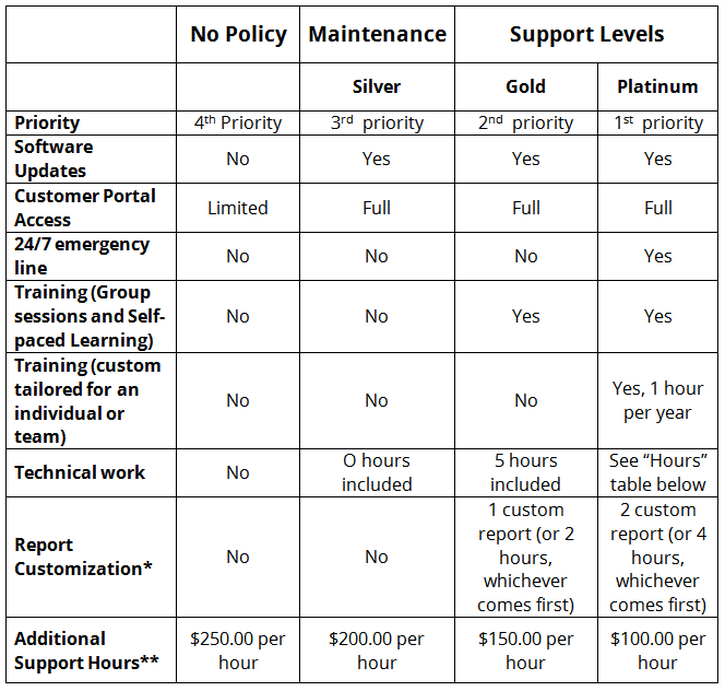 Hourly Support (pay-as-you-go) is available for clients with either “No Policy” or Silver-Maintenance, or for those who have exceeded their included annual support hours on the Gold or Platinum support level. Only customers on Annual Maintenance (Silver), Gold, and Platinum support levels will be eligible to receive software updates. Customers not on support will be required to purchase support hours prior to receiving support. Support is only available for version 5.7 of Tailwind or higher.